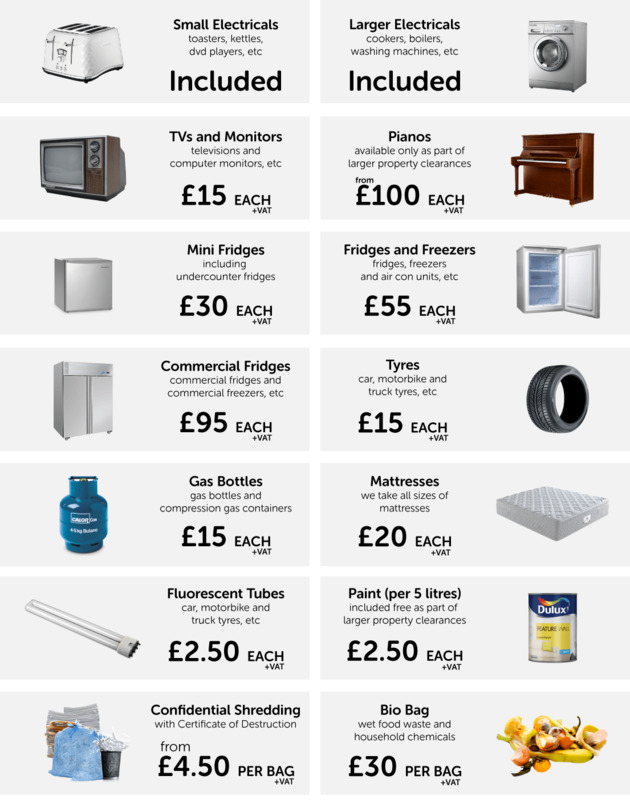 We are the apartment clearance experts in London and Surrey. Our clearance crews can perform a full apartment clearance service, removing all the items you request, such as personal possessions, carpets, white household appliances, electrical equipment, and all the clutter, junk and rubbish that you need to be cleared. Cullens are recommended, vetted and monitored by Checkatrade. Previous customers have rated our service at 99%. Our clearance crews are specially trained apartment clearance operatives. This means that they have the skills, knowledge and experience to clear your home quickly and respectfully. Get a free instant online estimate for a Apartment Clearance, or call us on 0800 033 7930 to speak to a member of our team. So, how much does a Apartment Clearance cost? Well, we have a simple price list for you below to make this whole process as simple as possible. 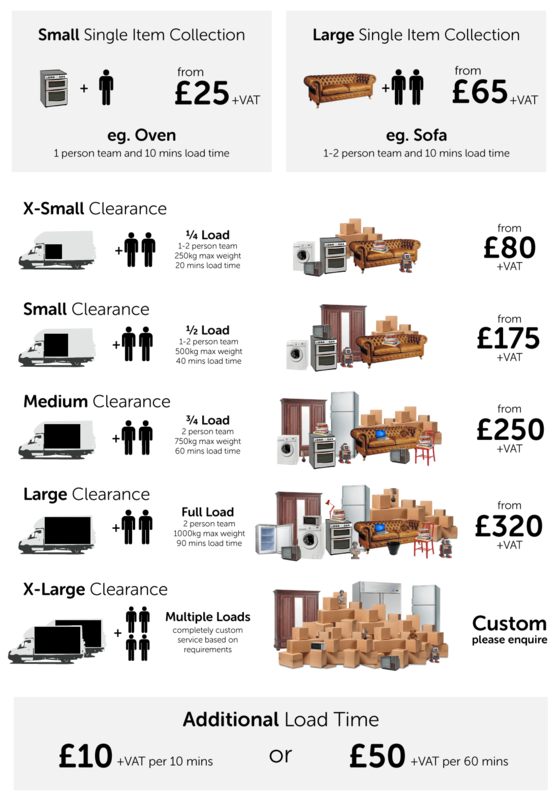 Please visit clearance price list for full guide and FAQs about our prices. If you need a custom estimate then please do not hesitate to get in touch with us and we'd be more than happy to help. Cullens works across parts of London and Surrey. Please see our area coverage for a guide to the areas covered for Apartment Clearance services. We are expanding our business which means that in some areas we provide only a limited service level. To make booking our services as simple as possible we have created our 6 simple step guide. From start to finish: you select the service you require, such as our Apartment Clearance service; check that we offer that service in your area; you can use our free instant online estimate tool to get a rough price; and when you are happy to proceed you can book in our service. What happens next is we turn up on time, introduce ourselves, and start working straight away. When the work is complete we sort through the items at our warehouse to divert as much as possible from landfill as per our Reduce, Reuse and Recycle ethos. 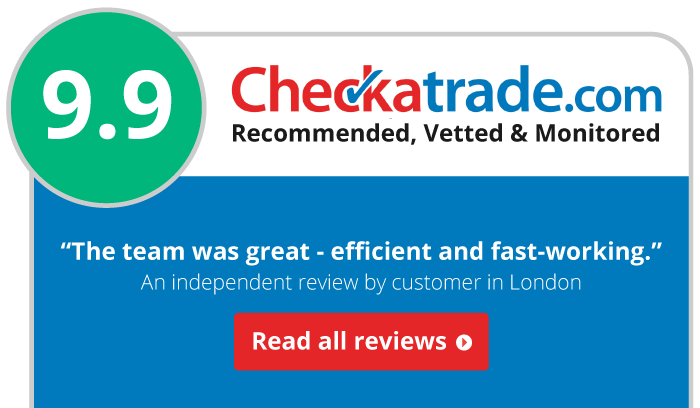 We ask all our customers to leave a review of our services on Checkatrade. Below are some frequently asked questions regarding our Apartment Clearance service. You can find company wide questions answered on our FAQs page. Alternatively, if you require further information on our service then please do not hesitate to get in touch. During a Apartment Clearance, we can clear most types of items including furniture; electrical equipment; fixtures and fittings; rubbish and waste; and general clutter. Let us know what items you need clearing for a more accurate estimate. How much does a Apartment Clearance cost? Other than Apartment Clearance services, what other services do you offer? Where do you provide Apartment Clearance? For Apartment Clearance, we cover parts of London and Surrey.